An analysis of Twitter data from the U.S. shows that social media usage largely mirrors daily work schedules and school calendars. The data reflect the amount of "social jet lag" caused when social demands make people wake up much earlier than their biological rhythms would prefer. In a new study published November 15 in Current Biology, researchers from the University of Chicago analyzed the Twitter activity of more than 246,000 users from 2012 to 2013 to look for daily patterns of usage. The tweets were tagged with geographic location data from more than 1,500 counties in all 50 states and the District of Columbia. The data serve as a proxy for people's sleep and wake times, a public record of sorts that shows when someone is awake and still using Twitter. Across the U.S., there is a daily slowdown in tweets at night when most people go to bed. The researchers saw that this nighttime lull shifts to later times on weekends relative to weekdays, a phenomenon they call "Twitter social jet lag." The magnitude of this shift, which is the amount of time someone stays up later or sleeps in on the weekend, varies across the country and with the seasons. 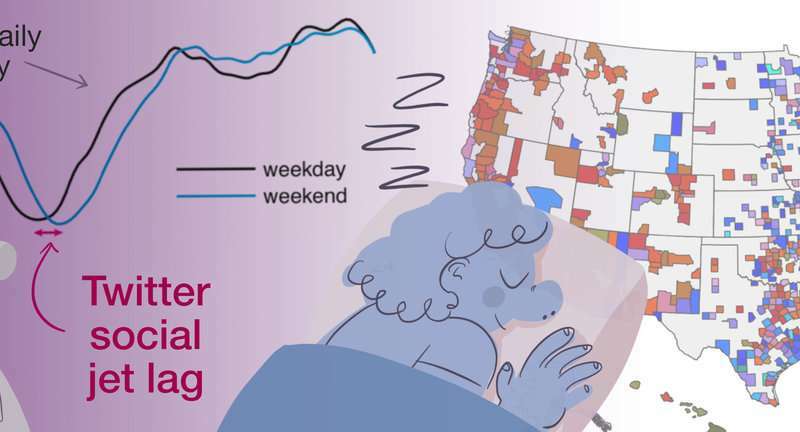 The West Coast experiences less Twitter social jet lag than the rest of the U.S. Most counties see the largest amount of social jet lag in February, and the lowest in June or July. The study also shows that these shifts tend to coincide with relaxed social schedules due to K-12 school holidays and summer breaks, rather than the seasonal effects on the amount of daylight. Without early school drop-offs and bus schedules to dictate wake up times, parents and students tend to sleep in—and start tweeting—later in the day, probably more in line with their natural circadian rhythms. "We started the study expecting it to be a solar or seasonal effect—that your internal clock will shift in the summer and that will lead to decreases in social jet lag," said Aaron Dinner, Ph.D., professor of chemistry and one of the study's senior authors. "But in fact, that's not what we found at all. People get up later on weekdays in the summer because their social constraints are relaxed. Weekend behavior—and presumably a person's biological clock—does not change much over the year in most counties." Lack of sufficient sleep and poor sleep schedules have been linked to numerous health problems, including obesity, diabetes and cardiovascular disease. The patterns of Twitter activity also tracked with obesity rates. Counties with higher levels of social jet lag correlated with higher rates of obesity. Information about sleep schedules also correlated with data from conventional sleep studies where people report how much sleep they get on a nightly basis. "I was impressed that so much could be learned from this purely public data set that was not at all intended to tell you about sleep," said Michael Rust, Ph.D., associate professor of molecular genetics, cell biology and physics and the study's other senior author. "In fact, we could rediscover things like the correlation with obesity or levels of social jet lag based on time zone that were found in other studies where people designed surveys to ask about sleep directly." For Dinner, Rust and their colleagues, studying social media activity is far afield from their usual work in chemistry, cell biology and physics. Rust's group normally studies cyanobacteria, a type of bacteria that generates energy through photosynthesis like a plant. Like many organisms, cyanobacteria have a circadian clock, a biological rhythm that synchronizes activity like rest and growth to daily changes in the 24-hour day. In a 2015 study, Rust showed how the circadian clocks of these bacteria are determined by metabolism, not daylight. Eugene Leypunskiy, a graduate student who led the new Twitter study, had been looking at how these photosynthetic bacteria respond to seasonal changes. The bacteria do tend to shift their activity according to the seasons, which led the team to wonder if those same patterns apply to humans. While this is not the first scientific study to look at patterns of activity revealed by public Twitter data, it represents a snapshot of a unique period in time. During 2012 to 2013 when the data was collected, geolocation was turned on by default in Twitter's apps. That's not the case now, meaning there are fewer public tweets available tagged with location data. In the years since, Twitter has also shifted from a platform where people tweet about quotidian details of their personal lives to a relentless firehose of news. Because of those changes, Twitter usage may not be the best proxy for sleep schedules today, but the study hints at what other patterns could emerge from electronic data. "What is most exciting is the possibility of using devices where a user opts in to provide data, like a smartwatch or fitness tracker," Rust said. "If we were able to get access to the kind of data where you can follow one person over time and see how the rhythms of their behavior are changing, you might be able to give that person quite useful information about their biological clock."